The original recipe was from Tiger Wok cookbook by Chef Charlie Yong. But he does the pandan kaya. I just modify it by using orange sugar. 1. Sieve beaten egg into a bowl and add coconut milk and sugar to stir and mix evenly. 2. Heat up the wok without oil. 3. 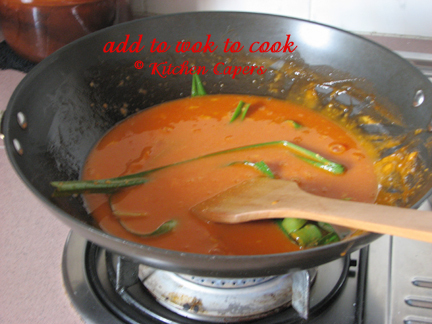 Slowly pour into mixture and add pandan leaves. 4. Lower heat and stir occasionally for 15 minutes. Or until mixture gets the consistency of cooked kaya. 5. 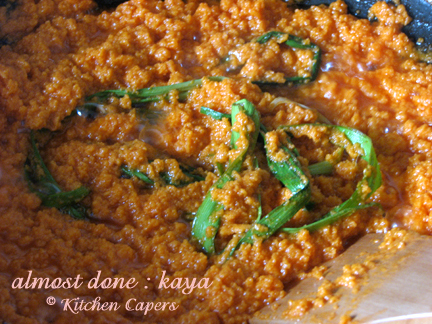 Discard pandan leaves, scoop out kaya and leave aside to cool before storing. 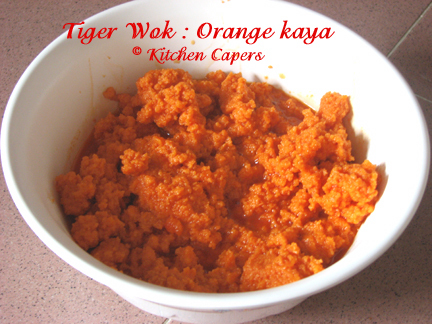 **Try to cut down the orange sugar to 120g and add 50g of white sugar. I have added 200g of orange sugar. Although its not very sweet, its too orangey.